After my junior year of college, I spent three weeks studying abroad in London, England. Needless to say (as my family can attest to because I never shut up about it), it was an absolutely life-changing experience that I can never forget. I am so thankful I was able to study abroad and make the memories that I did. 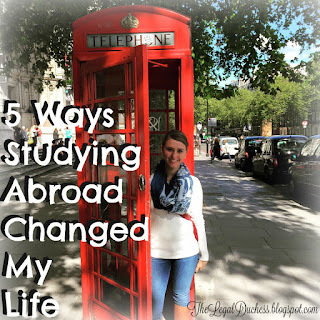 Beyond that, studying abroad truly changed me as a person in five major ways. Prior to studying abroad in London, I had never traveled anywhere without my parents, friends or fiancé. I took off to London, England, all by myself with a suitcase, a backpack and a whole bunch of plans. While I did become very close friends with my fellow classmates and we did a lot of things together, this was still something independent for me. I planned an entire trip to Ireland 110 percent by myself; I also completed a large research project by myself. I figured out how to navigate the Tube by myself. The sense of independence I gained while studying abroad is priceless to me because it helped me to give up some of my shyness and need to hide within a group. I gained the confidence to do things on my own and strike out with my own ideas and adventures and see where they lead. I cannot express how much I value that growth of independence within myself that I gained while studying abroad. 2. I opened my mind. Prior to London, I had never been out of the U.S. unless you count Canada and Mexico. Going to a new country with a new culture made me open my mind. I learned to accept and embrace cultural changes. I learned to try new food and drinks. I am normally a very closed and sedentary person; I like things a certain way and to stay comfortable. Studying abroad thrust me totally out of my comfort zone and made me open up and go with the flow. I have tried to maintain that upon coming home. I try to say yes to things more often than no and seek adventure instead of hiding at home. 3. I learned it's OK to get lost. I am a type-A, OCD-planning fanatic. I plan everything right down to the minuscule detail. Case in point: before going to London, I had every single day planned out and day trips booked. I was packed two and a half weeks in advance, and I had even Google mapped the route from my apartment to a grocery, the nearest Tube station and The University College of London where I would be studying. Despite all my obsessive planning, things went awry and plans did not work out. Sometimes I had a certain event planned but something better came up and I just went with it. Usually, the experience I had in replacement of my planned event was more memorable. I got lost for two hours one morning while trying to find a museum. Instead of getting upset like I normally would have, I embraced the experience and all the neat things I saw along my route. I still love to plan and have things go according to plan, but when things go awry now, I try to embrace it and see where it takes me because some of my best memories in London came from being completely lost and confused and stumbling upon something great. 4. I learned to appreciate my home. Though I love London and am dying to go back ASAP, my time across the pond made me appreciate my sleepy little Ohio hometown. The minute I officially committed to study abroad, I was so excited to get out of Ohio cornfields and explore one of the most cultured cities in the world. By my third week there, I was definitely ready to come back home. I missed my family, my friends, my pets and the wide-open spaces. I realized how wonderful my little town is, even if it is not anything like London. I would visit London over and over and over and even live there for a brief time, but Ohio is home. Ohio is where I want to raise my children and live out my days. If I had not studied abroad and fallen in love with London, I may have never learned to appreciate why home is home. 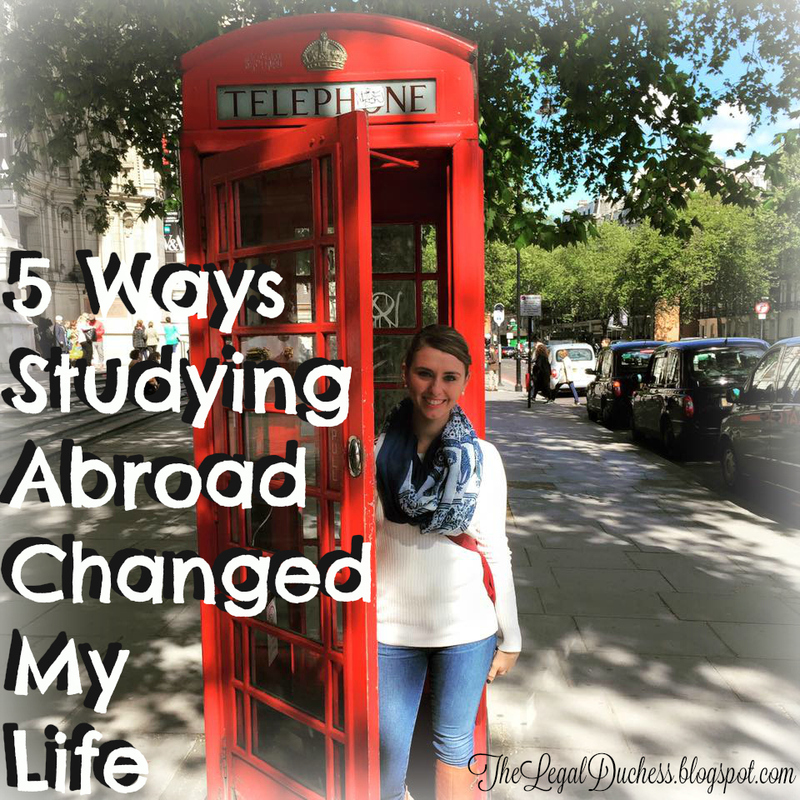 The biggest way studying abroad changed my life was that I became so empowered by the entire experience. Something about traveling the world on my own and making memories for a lifetime left me feeling like I could take on anything life throws my way. Going to law school can't be any more intimidating than planning an entire trip to Ireland by myself and staying in hostels, and yet Ireland was one of the greatest experiences of my life. Buying a house? Can't be anything harder than navigating the night buses at 3 a.m. trying to get back to our flat (which I did successfully in order to get home). Going to London was scary and intimidating. Living in London for three weeks was an experience that was not easy, but yet it's something I accomplished and I made the memories of a lifetime. If I can conquer traveling abroad at 21 years old and alone, I feel like I can do anything. I am so thankful that I had the opportunity to study abroad in my college career. I cannot express how much of an impact the experience had on my life. Saying goodbye to London was hard, but I know I will go back someday. I left a little piece of my heart there and it left a pretty big impact on me.